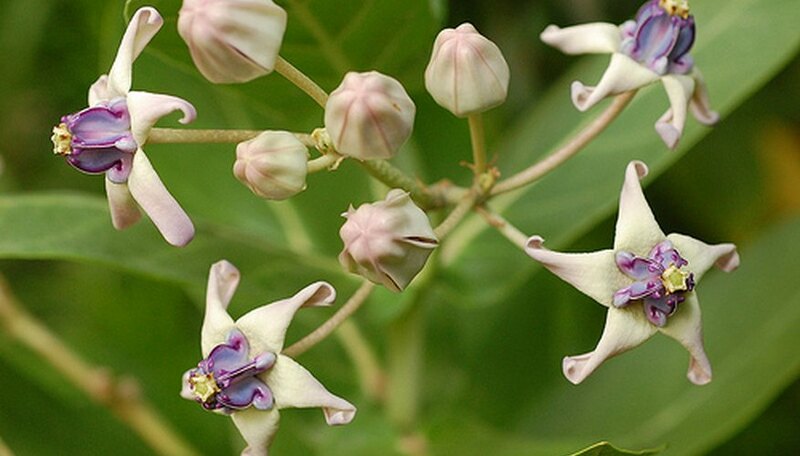 Crown flowers (Calotropis gigantea), or giant milkweed, are actually weeds in their native India, Iran, Tibet and China. With their tall stalks, reaching eight to 10 feet in height, and their unusual flowers, they add interest to a tropical garden or greenhouse. While they only grow in zones 10 and 11, crown flowers aren’t difficult to propagate. Choose a spot to plant your crown flower. Crown flowers like full sun, but they can handle partial shade, too. Obtain a whole crown flower or a branch of a crown flower. If you have the branch, soak it in water until it sprouts roots. This should take about a week or two. Once the roots have sprouted it is ready to plant. Plant the crown flower. Dig a hole for the crown flower deep enough to accommodate the roots, about one to two feet deep and one foot in diameter. Place the crown flower in the hole and fill with soil. Pat it down firmly. If you are planting the branch, dig a small hole, about six inches deep and three inches wide. Place the branch in the hole and fill it with soil, patting down firmly. Stake the branch until it can hold its own weight. Water your crown flower once a week for five minutes each watering. Prune the crown flower when it is three feet tall. Remove any dead or damaged branches. Trim any over-reaching branches. Prune once a year for the crown flower to have a full shape. Monarch butterflies lay eggs on the crown flower. If the caterpillars eat the crown flower, it will grow back. Do not over water your crown flower.